The success of the implantologic treatment depends on many factors of surgical, prosthetic and prophylactic nature. The kind of the implantologic system is of particular importance so far as it fits to the specific clinical case (the kind of the prosthetic restoration, the bone type). 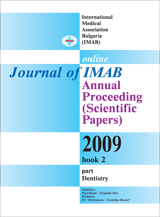 The combined support, both on natural teeth and implants, is criticized by a number of authors. The most impartial assessment of the functional suitability of the implantologic treatment however, is the time proof.